There are three levels of the supply chain in the office products and supplies industry. Firstly, the manufacturer, secondly the distributor and then, the final link in the chain, the dealer or reseller, from whom the customer buys its desired product. Overall the office products industry is mature and well advanced in terms of its consolidation cycle and approaching its merger endgame. As a consequence, future mergers and acquisitions are more likely to be scrutinized by government authorities, who will be increasingly concerned about reduced competition, and the potential for merged entities to exert market and pricing power and adversely affect consumers. The most common tool used by anti-trust organizations around the world, for the purposes of evaluating proposed acquisitions, is the Herfindahl-Hirschman Index (HHI). This measures the market concentration of an industry's 50 largest firms in order to determine if the industry is competitive. The Herfindahl Index formula is calculated by squaring the market share for each firm and then summing the squares. The lowest Index score is 1, representing perfect competition and the highest 10,000, representing a single-player monopoly. A market with an HHI under 1,000 is considered competitive. However, either the FTC or the Justice Department in the United States (and similar government authorities around the world) will scrutinize a proposed merger in an industry that results in a projected post-merger HHI of between 1,000 and 1,800, and will be almost certain to outright reject approval for mergers that result in a post-merger HHI exceeding 1,800. Below are three tables, one for each of the three categories that make up the Office Products and Supplies industry in terms of manufacturing and distribution, along with the basic market shares and HHI Index calculations. Once Hewlett Packard completes its acquisition of Samsung's printer business, there will only be eleven original equipment manufacturers remaining around the globe manufacturing office printing hardware and the associated supplies. These eleven enterprises have total annual sales of just over $170 billion and form a moderately concentrated global industry with the top 3 OEM's having 60% market share and the defined (global) market an HHI score of 1,568. In the United States there are fifteen distributors remaining but, the market (as I've defined it) is highly concentrated with the top 3 participants having 85% share and creating an HHI score of 3,110. Ingram Micro, the largest player, was recently sold for $6 billion to the Chinese HNA investor group - a transaction that would not have affected the HHI or market shares as it was just a change of ownership. Based on the market definition I've used, it's difficult to see the FTC allowing any further consolidation among the larger players to take place, as the market is already significantly beyond the 2,500 point threshold defining it as monopolistic. There are as many as 7,500 U.S. resellers of office products and supplies so, on the face of it, you may think this would make for a highly competitive market. However, the top 3 resellers have 62% share of the market making future deals between the larger players difficult because anti-trust authorities will be likely to closely scrutinize them and their potentially harmful impact on competition. The HHI for this broadly defined market is 1,518 which is approaching the border (1,800) that defines a highly concentrated, or oligopolistic market. Any deals between the larger players will most likely take the Index above the 1,800 point threshold and almost certainly not be permitted. Each of the three segments forming the Office Products and Supplies industry is significantly concentrated based on the simple market definitions I have used. It's quite possible the FTC or Justice Department may look at proposed mergers using different definitions of the market and therefore, it's possible favorable outcomes to proposed mergers could still occur. 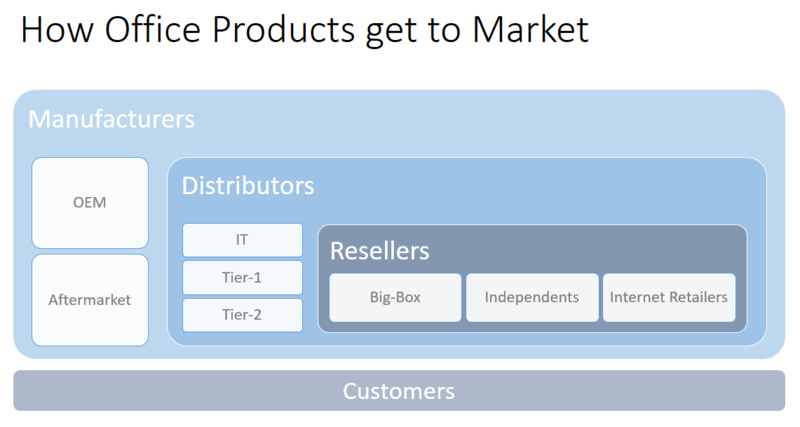 However, based on the existing levels of concentration, it's quite difficult to see any significant merger activity permitted between the larger players in either the distribution or reseller components. Because most of the remaining OEM's (eight of the eleven) are Japanese enterprises, it could mean the Japanese Fair Trade Commission considers the Japanese market quite competitive - i.e. there are eight companies competing. If this were to be how they viewed their domestic market then they may allow additional mergers to take place. For this reason, I think it may be more likely that mergers may be permitted within the Japanese OEM component of the industry. This, in turn, may put the remaining non-Japanese players (i.e. Hewlett Packard and Xerox) at a competitive disadvantage. However, what I see as a more likely area of activity over the next few years is the continued acquisition of U.S. distribution and reseller assets by Chinese companies. This activity has the potential to completely change the landscape of the office products and supplies industry and is unlikely to attract the attention of the FTC or Justice Department. Chinese products that are currently prevented from entering Tier-1 distribution channels may face significantly fewer barriers if the distributors and resellers are all owned by Chinese investors! Should this scenario continue to play out, it's difficult to see a positive outcome for the aftermarket players currently dominating the Tier-1 distribution channels. However, they're not likely to give up without a fight, so it will be interesting to see what defensive measures they (Clover, Turbon and to a lesser extent LMI) deploy to counter this threat.